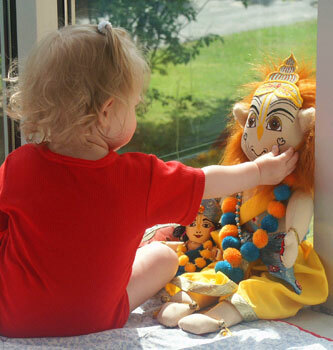 We hope that our toys will introduce children all over the world to an early love for their dearmost friend, Krishna, through the sweetest of His pastimes - play. "From his very birth, Uddhava was a natural devotee of Lord Krsna, or a nitya-siddha, a liberated soul. From natural instinct he used to serve Lord Krsna, even in his childhood. He used to play with dolls in the form of Krsna, he would serve the dolls by dressing, feeding and worshiping them, and thus he was constantly absorbed in the play of transcendental realization." For more information please contact us by email. Site best viewed in Mozilla Firefox or later browser.